Pantomimes have taken a good couple of hundred years to evolve from ballet and variety acts, they’ve at times been four-hour sprawling shows with a lavish ballroom scene. These days they’re more likely to be a string of doubles-entendre hung loosely over a plot that gives a TV personality a chance to expand his or her range beyond looking fetching in swimwear. In their heyday they were so engrained into the British culture that it would have been hard to imagine any media outlet that didn’t shoehorn its presenters into an in-joke laden panto – to the delight of the audience and also the schedulers that could fill up hours of festive programming. That they’d also turned into a fiesta of cross-dressing, was just a bonus. They may not be as culturally relevant now, but the traditions are well-established and they are even starting to see signs of a post-modernist revival. Panto is an ideal format for a community project, as it has well established traditions – and just a few basic plots. If a show is Robin Hood, Puss in Boots or Alladin the audience know that the basic plot will be boy meets girl, boy gets girl, while thwarting “baddie”. Maybe it’ll be the girl that does the thwarting, or maybe (Beauty and the Beast) the baddie will be our own prejudice that looks are more important than personality. Whatever, there’ll be slapstick, there’ll be a slushy dance scene and something will be quite obviously behind someone else – while they are seemingly doomed never to catch a glimpse of it. But why did I organise one online, and why twitter? For one, to see if it could be done — most forms of social media are deliberately asynchronous, which has destroyed the narrative for a lot of attempts at ‘drama’ in this new medium. To play any form of drama across blogs or Facebook means to either extend the timeframe hugely — forcing a ‘serial’ structure onto the story — or to leave it as a series of interconnected posts (by which I mean anything put on the social web) which the ‘viewer’ has to explore in order to piece the story together. Twitter might be ‘ambient’, in the sense that you’re not expected to read every message, but it has a definite place in time — allowing a drama to take place at the speed which it works. The main question was whether the limits of the system (140 characters, the inability to create chatrooms to separate out the cast) would prevent people either ‘acting’ or ‘watching’. As the one thing that online activity lacks is location (there are services that do use geo-location, but none that could be faked to take place in fictional ‘pantoland’), the heavily structured pantomime format really helped. The small number of easily explained settings meant that a quick bit of narration was enough. Pantomime, with its obvious (and easily understood) tradition of audience participation, also seemed to be ideal for the (I’m sorry) “drama 2.0” idea — there’s little interesting in simply moving the text of a play onto the social web, but without structure it would be very difficult to nudge the audience into ways they can participate. So, how did I start it and how did it come about? You can see that at this stage I’d not decided on the plot, or the hashtag (more later) method of keeping the posts together — I’d not canvassed any support before this either. If no-one had responded, there wouldn’t have been a twitpanto. Casting — I mainly let people pick roles on a first come-first served basis (they were mainly people from my network that I trusted to now enough about both twitter and pantomimes to be able to do it). 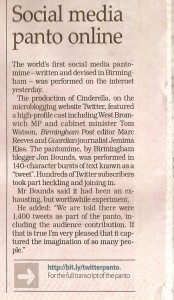 Although I did think that the idea could be livened up with a few cameos from well known people — as it turned out “internet famous” was enough (and Tom Watson MP and The Guardian’s Jemmia Kiss‘s addition to the cast did stir up some attention). ‘Who’ was mainly important in regard to thier enthusiasm and skills, but people with large networks are always goog to have around. Script — As audience participation was to be important, and because unlike in a theatre the gound is level on twitter for each person (cast or not) there had to be room to improvise. So the first bit of scripting I did was more background than words, giving people some idea of how thier characters would behave online. You can see it here. The final script had a little more structure than I’d envisaged — due in part to the need to whip thought it quickly. Even though there were lines to ‘say’, people were encouraged to alter the words as long as they kept the meaning. The script had to be kept secret, but it’s now online for everyone to see. Using the collaborative aspects of the online world were a main driver, and allowing people to have fun and be spontaneous was a way to keep people interested and involved. Time — The choice of time was important, twitter usage goes through spikes during the day and the week. Picking an afternoon when people were likely to be at computers, but looking for festive distraction was a good reason why we had an audience as large as we did. Just beacuse somethings’s online it doesn’t mean that it exists in isolation, thinking about competing attractions offline is fairly important too. Staging — The established way of following conversations on twitter is the use of a hashtag — a word that everyone agrees to include in all related posts, separated out by use of a hash ‘#’ before it. Having decided on #twitpanto I decided to let people use their favourite or usual way to track it. Because anyone could use the tag it was possible that people could have attempted to hijack or spoil the stream — to that end I was glad that Michael Grimes (as well as playing Buttons) spent time constructing a ‘clean’ feed with Yahoo Pipes. Despite the desire to control, for anything to succeed in the online sphere it helps to let people interact how they’re used to. Promotion — I didn’t do any, trusting that with 20+ people in the cast they would be talking about it to thier networks online — and that would mean that we had enough people to for an audience of sorts. I did knock up a poster, which Created in Birmingham used in their blog post pre-panto. 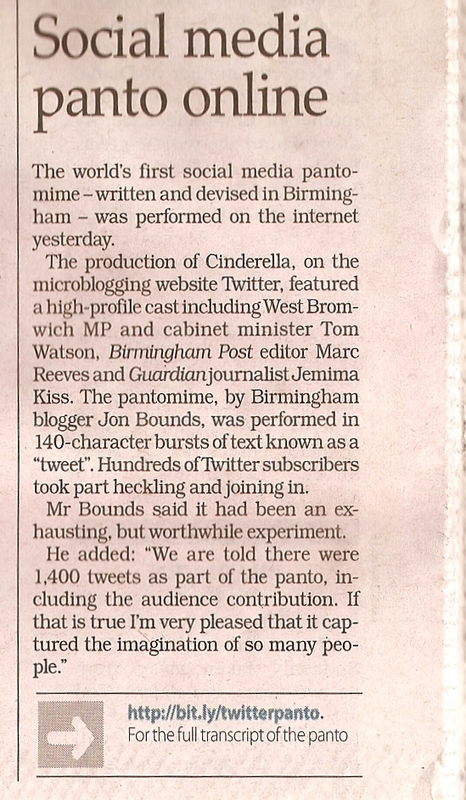 It was a little amusing on its own, and helped to set the tone of the piece — the “in joke” of the Fail Whale indicating that the panto would reference twitter itself. There was also a quick website knocked-up, but it wasn’t really needed. The word did spread through the twitter networks, and by people enjoying talking about it — the hashtag becoming featured on twitter’s search “tending topics” and attracting some other attention. That lead to some other blog posts and people from outside the immediate networks of the cast becoming aware. If something’s fun, as telling people that you’re going to be in a panto is, then the word can quickly spread. Well, the best judges of that are the audience — and there seemed to be a lot of positive tweets around in the aftermath. There was also positive blogging from some of the cast (Chris Unitt, Emma Jones), some of the audience (Nick Booth, Tom Roper, Actors Online) and even a mention in the Birmingham Post newspaper (24/12 p11) and the Register. As an experience to participate in it was exhausting — nervous about whether it would be a success, whether the actors would turn up, frantically refreshing the web pages. Without the help of Joanna Geary (who took over narrating duties) I don’t think I could have coped. But everyone did turn up, and followed the instructions — there was some superb improvisation and use of other web services (Chris Unitt’s use of Blip.fm in the run up to curtain up was inspired). There were nearly 1,400 tweets tagged #twitpanto and over 150 people using the tag on the day (the count is still ticking up). In terms of levels of interest and enjoyment I’d say it certainly did work. Why did it work, and what lessons can we learn? Make something involving and people will want to get involved (obvious perhaps, but the interaction is the key point). One thing that did contribute greatly to the ease of following the panto was the tool quickly built by Matthew Somerville — a version of Roomatic that allowed people to see every tweet, but highlighed those by the cast. I don’t think it’s something that anyone would have thought of before, but the sheer volume of audience participation made it important. I purposely wanted not to create a ‘central point’ to watching (in fact it was part of the fun to see bizarre panto tweets appear in people’s statuses) — but this was a loose enough one (akin perhaps to opera glasses, just making the happenings a bit clearer) and it didn’t prevent people watching through any other means. At least one person (whether maliciously, or because the thought they were funny) did attempt to disrupt the stream of tagged posts — but because there were enough people enjoying playing by the (loose) rules they were easily ignored. I’m still glad we had the back-up plan of the “clean feed”. And, most importantly, panto and online communities are bloody great. There’s a transcript of the panto (again pulled together by Matthew Somerville) online and I still think it’s worth a read.